It is a road movie set in Iceland and was the first of Fridrik's films to be made in the English language. The movie depicts the travels of a Japanese man across Iceland. It was jokingly promoted as the best Icelandic-Japanese road movie of 1995. "Hirata finds himself canceling his vacation plans to Hawaii when his grandfather reminds him of his duty to his parents. Seven years earlier, Hirata's parents had been killed in an accident in Iceland and Japanese tradition holds that their souls will not be at ease until the proper ceremonies have been performed. 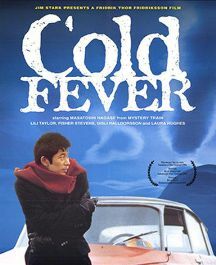 "Far from being a random sequence of oddball occurrences, "Cold Fever," under its jokey surface, has a steady allegorical resonance. Mr. Fridriksson, the film's director, is best known in this country for his 1991 movie "Children of Nature," which won an Academy Award nomination for best foreign film.